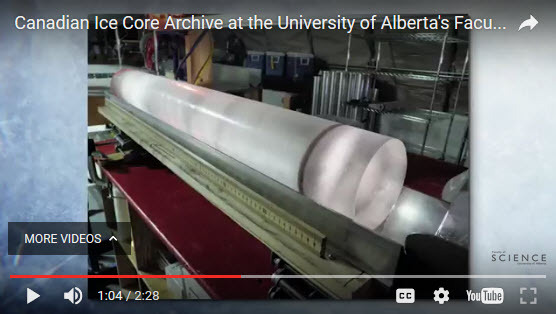 The U of A is now the new home of the national Ice Core Archive (Canadian). Formerly was housed in Ottawa, but there had been concerns about the facility there (e.g. non-interruptible power supply needed, else ice cores can become water samples). The ice cores span about 10,000 years (the time since the earliest ones were originally deposited). They total about 1.7 km of cores (multiple smaller cores, from multiple locations). Obviously, they are very fragile, and have to be handled and stored with great care. o Knowledge of atmospheric gases, at time of deposition (obviously CO2 and other greenhouse gases of great interest). o Knowledge of microbes and pollutants (man-made, or natural events such as volcanic eruptions) at time of deposition. o Physical condition of ice (e.g. density, snow vs ice vs permafrost), layering, etc. can give indications of temperature and other conditions at time of deposition. o All of these have obvious applications in the study of global climate history and implications for global climate change. 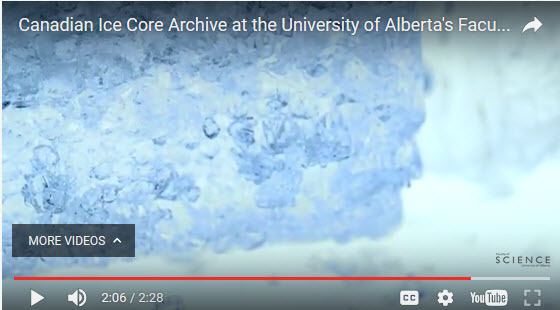 The collection of ice cores were from various Canadian Arctic Islands, as well as Mount Logan (highest peak in the Canadian Rockies, in Yukon Territory). 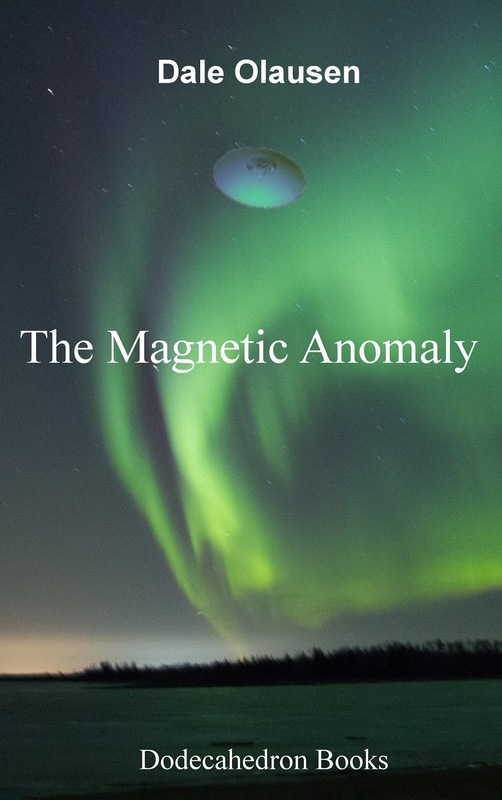 They were collected by the Canadian Geologic Survey (a renowned federal government funded research agency) over a period of 50 years. The cores are up to 80,000 years old, although most are in the 10,000 year range. Many go back to the last ice age. 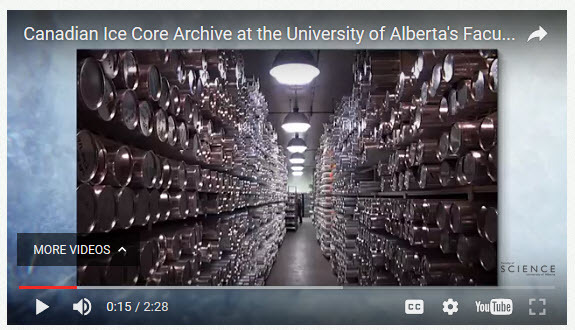 The Ice Core Archive includes a research facility, a processing facility and storage/archive facility. He is in the department of Ocean/Earth Sciences. It’s on Amazon, and looks fascinating, in my opinion, though it is a tad expensive, as university texts often are. He has visited Canada extensively, including Alberta, as he is a “lover of mountains”. Dr. Cuffey noted that it is in our interests to study and understand the Earth, both from a practical and aesthetic point of view. For example, by determining the temperatures under which Antarctic ice has formed we can infer what the climate was like in the past, 20,000 or more years ago. We also strive to determine what the drivers of changing climate were in the past, and therefore understand the risks that we face today. He noted that Ice Core Science and Earth Science in general has to be mostly observational, at the highest levels, though nature has provided us with some natural experiments. o Small scale pollution studies. o PH concentrations over time. o Spores and other life studies. o All of these can be found in the ice or inferred from the ice. o They exchange mass with the wider environment, via accumulation of snow and ice during cold seasons, and melting during warm seasons. o They flow, slowly, over time, as they are a state of extremely viscous fluid. o They also change their size and other characteristics, due to longer cold seasons during some times (grow) or longer warms seasons at some times (retreat). o This can be seen in photos of glaciers flowing over the past century or so – Kurt Coffey demonstrated this with a series of photos of a glacier in New Zealand, taken over the last 50 years. o As a geologist might note, this leaves behind various phenomena, like eskers, drumlins, glacial till, moraines, U-shaped valleys and so forth, which help them to interpret the forces that have operated on the Earth, as well. o Big glaciers are actually very flat. Therefore they have stratigraphic layering, with layers being quite horizontal. o The weight of ice above a given layer, will compress that layer. That will vary with the depth of the layer. o Basically, that means layers will get thinner and denser as you go down. o Seismic analysis can also be done (similar to oil exploration), to determine the position and characteristics of layers, without actually drilling. o That’s because seismic work depends on velocity of sound waves changing when density changes, resulting in reflections and refractions (Snell’s law, etc.). From these, information can be inferred about the layering. o Drilling cores is a lot like drilling for oil or drilling core samples in geophysical exploration, but you go through ice instead of rock. Obviously, you have the additional problem of ensuring that the samples don’t melt. o Snowfall levels at time of deposition. o Age of the ice (oldest ice cores from Antarctica are about 800 K years). o Volcanic eruptions, that deposit very fine ash, etc. (travel through stratosphere). o The evidence of orbital mechanics of the Earth can be seen in ice cores, as these affect climate (precession and other wobbles of the Earth on its axis). o This correlation is useful for calibration (we know lots about orbital mechanics, so we can see how the tilt of the Earth (e.g. Milankovitch cycles) has affected climate and glaciation in the past, for example). o One way of inferring climate is from isotope concentrations (e.g. concentrations of heavy to light atoms of oxygen and hydrogen, “heavy water”, etc., which vary with temperature). § Some is held back for later analysis, archival purposes. o Borehole temperatures are also recorded, to correlate with ice characteristics at depth, such as density profiles, etc..
o Gases are trapped at depth, as snow turns to ice, so this is an indication of the atmosphere at that time. o There is evidence of very abrupt transitions in global temperature, via ice core sample analysis. These can be correlated with CO2 levels in the ice, among other things. o So, ice core analysis shows how the global temperature has varied with greenhouse gases and the Earth’s albedo over time. o Due to “polar amplification” of global climate change, ice cores from arctic and Antarctic locations are sensitive indicators of past climate change. o Dr. Cuffey noted that the idea of greenhouse warming goes back to the 19th century (Tyndall, Arrhenius). It wasn’t really scientifically controversial until concerns about it threatened status quo economic interests. 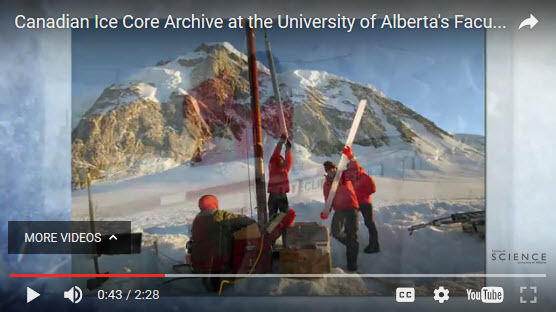 One of the people that I work with at the University of Alberta, (in a data warehousing and data science role), has a brother that does glaciology in the Canadian Arctic, drilling and recovering ice cores. Basically, they fly up to the arctic, set up and camp and drill ice cores during the research season. She mentioned that, one year, a helicopter had a hard landing (a crash, but nobody hurt), which necessitated bringing a large camp of supplies and technicians, to repair the helicopter. Rather expensive and delayed the field work, but these things happen during field work. My take on it – there’s the opening scene of a potential arctic sci-fi nail-biter. By the way, the room was dark when I took my notes for this Ice Core lecture, so some material was difficult to decipher. Thus, there could be the odd misinterpretation of some content of the talk. Though, I did study geophysics before segueing into statistical analysis and data science, so it should be reasonably accurate, for the most part.